Plasma is an electrically conductive gas. The ionization of gases causes the creation of free electrons and positive ions among the gas atoms. When this occurs, the gas becomes electrically conductive with current carrying capabilities. Thus, it becomes a plasma. Plasma cutting is a process that utilizes an optimized nozzle orifice to constrict a very high-temperature, ionized gas so that it can be used to melt and sever sections of electrically conductive metals. The plasma arc melts the metal, and the high velocity gas removes the molten materials. Plasma is also called the fourth state of matter (the other three are the well-known solid, liquid and gaseous states).It is ionized gas consisting primarily of positive ions and electrons (negative particles).Since the starting material is gas with no electric charge, plasma contains approximately the same number of particles with positive and negative charges, so it outwardly appears to be electrically neutral. However, due to its structure it excellently conducts electricity. Gas can be ionized by receiving sufficient energy for the valence electrons (in simple words - electrons in the outer layer) to be able to break away from the atoms or molecules. Atoms with fewer electrons have a positive charge and are called cations (particles with "extra" electrons are called anions).When the power supply stops, the cations combine with the electrons back into gas. The most commonly used form of energy is thermal energy. The main function of the plasma torch is to generate an oriented stream of plasma that melts the material in the cutting area. Direct or alternating electrical current or another type of discharge are most often used as an energy source for heating the gas. The most common are torches using DC because, compared to AC torches, they produce a more stable flame, are quieter, easier to operate, consume less electricity and electrode material and are subject to somewhat smaller thermal wear. In the torch, there is a nozzle, from which a stream of inert gas or air flows. The nozzle also serves as a cathode. The anode can be the cut material, if it is conductive, or it can also be located in the torch. An electric arc is created between the electrodes, which heats the flowing gas to a very high temperature and part of the gas is subsequently converted to plasma. High speed of the gas flow ensures removal of the molten material from the cutting area. Plasma torches are usually water-cooled. The basic design has several variants. In addition to conventional torches, dual torches are also used, where secondary auxiliary shielding gas flows around the plasma stream and separates the cutting area from the atmosphere, thus allowing a cleaner cut. Auxiliary gas can be replaced by water, which in addition to protecting the cutting area can also cool it. Special designs are used for high precision cutting of thinner materials etc. 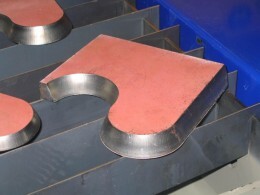 Most often, plasma is used to cut plates and sheets of steel and other metals, although it is possible to cut other materials as well, including non-conductive. It is commonly used for thicknesses to about 150 mm. It can be used for manual cutting or in CNC cutting machines, such as those offered by MicroStep.